For over 30 years, Miss Toronto has been the #1 Toronto Boat Cruise, safely sailing the calm waters of the Toronto Harbourfront, Toronto Islands and Lake Ontario. Discover just how great a trip on Miss Toronto can be for yourself. Host your next social event, business meeting, seminar, or sales promotion on board Toronto's Signature Yacht: the luxurious, MISS TORONTO. Our sleek-styled, seventy two-foot motor yacht combines the amenities and atmosphere of an "exclusive private yacht" with all the comforts of a land venue. MISS TORONTO is a Canadian built cruiseship. She is Toronto's most popular, meticulously maintained 100 passenger cruise boat. We respectfully suggest that you really "look before you book" your Toronto boat cruise: it is crucial that you inspect any boat before handing over your deposit. 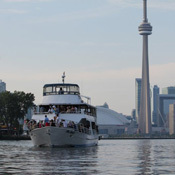 Whatever the occasion, dinner boat cruise, lunch boat cruise, wedding boat cruise, company event, cocktail cruise, or a private boat cruise on your own, you will be pleased by our high standard of service for all Toronto Boat Cruises. It is this personal attention to detail that causes our corporate clients to return year after year for their special business meetings or company "picnic cruises". Cutting through sparkling water on a Toronto Islands tour makes any gathering special and memorable, whether it is your company's staff party, your mother's birthday, or an up-close-and-personal view of the Toronto Air Show with your friends. As operators we know and appreciate the amount of time and effort that goes into planning an event. You can be certain of the best event possible: we will be there to welcome you aboard, ensuring that all of your requirements are cared for with professionalism and a smile. 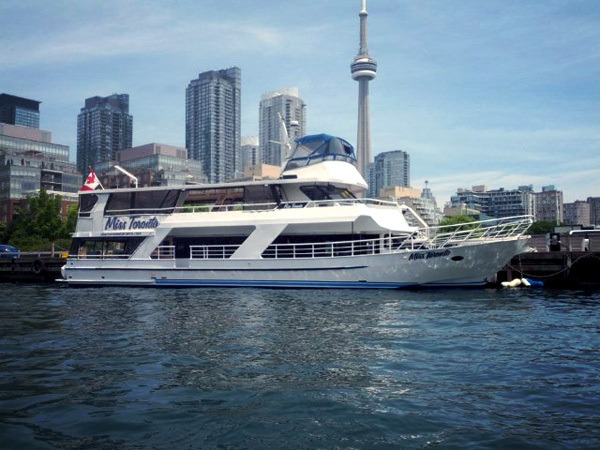 Step aboard Miss Toronto and create memories that will last a lifetime! Cleanest heads (washrooms) in Toronto Harbour!